Description: When the loyalist cause enlists the mountain house into a weaponry, apprentice Fia is confronted with three refugee children, a disturbingly upstart former messenger, and accidents happening everywhere. Are saboteurs out to nix the weapons works... or is it the incognito crown prince they're after? Traitor's Knife continues where Jeweler's Apprentice ended, and nearly seventeen year old Fia Brithin from the foothills still has a lot to learn about the mountains, and the people now in them. I had really enjoyed Jeweler's Apprentice and was eager to continue Fia’s adventure. So when I was offered an advanced reader copy by E. Kaiser, I was excited. First off, I was very touched to be mentioned, both me and Homeschool Authors, in her acknowledgments. I had no idea she had done that until I opened the book. There is something about seeing your name on an acknowledgement list just makes you feel appreciated. Before I praise the book, there were two things that I struggled with. One that I had was that sometimes the story seemed to slow way down. 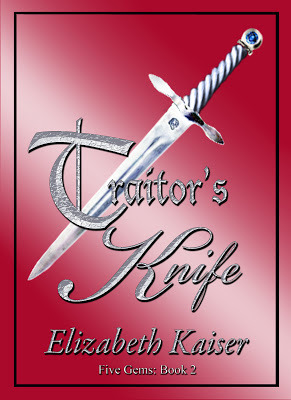 Jeweler's Apprentice had almost non-stop action and Traitor's Knife was a little slower paced. This isn’t bad; it just wasn’t what I was expecting. Also, it had been a while since I had read Jeweler's Apprentice. It wasn’t until I was 25% into the story when she reminded me of some of the key happenings. I felt a little lost up until that point. With that said, I loved the story. Just seeing what happens to Fia and the rest was fun. I loved meeting old friends and new, even if similarly spelled names sometimes were confusing. I was especially fond of the part where her sister comes to visit her. Even if this book wasn’t quite as action-packed as the last one, the ticking time bomb really made me want to keep the pages turning. You know that there are villains on the loose with an evil plan, but you have to read to the end of the story to find out who they are. The characters, not the action, is what really carries the book. Fia is one of those characters you have to know what happens to. You feel like you know and understand her. I recommend this for anyone who read Jeweler's Apprentice, those who love non-magical fantasy, and who are looking for nice, clean reads.